UZI 21" Expanable Baton is a lightweight (11.6 ounces to be exact) and compact solution to packing quite the punch when rendered necessary. UZI is on par with the quality of the competition with its version of the 21" expandable baton that includes its own belt holster. 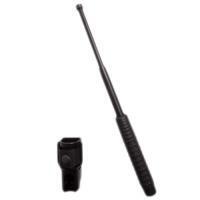 This expandable 21-inch baton has been Armed Forces tested and police approved, and the hardened steel of this UZI powerhouse is non-slip with its rubber grip. The UZI brand is a proven name since the 1950's and a maker of batons since the beginning. UZI's expanding baton earns the trust of the Army, Secret Service, and Special Forces. Works well at expanding and locking in. The rubber grip has slid down a little when trying to collapse baton. Not a big deal to slide back into place. I carry it when walking my dog in case of attack by loose vicious dogs as it is light enough to keep in my back pocket. The product works ok, the rubber handle sleeve however moves around and has to be repositioned which is annoying. Good baton. Solid handle, and friction locks really tight. Almost too tight, it's difficult to retract even when tapping against a solid object to loosen the locking cones. Numerous times I've had to really, REALLY slam it down against cardboard on concrete several times so hard the rubber handle will slid down (up, really) in order to retract the baton. The retention clip inside the cap doesn't seem removable but is stamped into the cap with a stud, too many adjustments and you're buying a new cap. Overall very good weight, excellent for quick defensive movement. The BIGGEST flaw is the retention holster, it rides too high on the belt and doesn't swivel as some product feature reviews suggest. The holster has one height, and one size. Not a whole lot of adjustment available there. Most product photos even display it incorrectly, the largest part of the holster is the bottom That means the expandable part of the baton sitting at the lowest part of the holster is barely at the bottom edge of your belt It rides WAY too high on your rig. Your practically reaching into your armpit to draw this thing, very awkward and unnatural.